 Commentary based on the New International Version (NIV).  NIV text printed in the body of the commentary.  Interpretation emphasizing the theological unity of each book and Scripture as a whole.  Readable and applicable exposition. 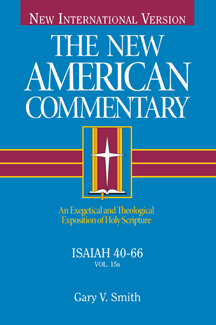 Gary V. Smith’s second volume on Isaiah looks deeply and in wonder at the God who is both intimate and compassionate (Isaiah 40:28: He gives strength to the weary and increases the power of the weak”) and larger than our comprehension of time and space (Isaiah 66:1: Heaven is My throne, and the earth is My footstool”).